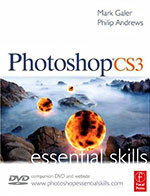 The Adobe Photoshop CS3 books have started to appear at Amazon.com. Below are short blurbs and links to Amazon where they can be ordered. "This thorough, self-paced guide to Adobe Photoshop CS3  written by the experts at Adobe Systems  is ideal for beginning users who want to learn key Photoshop concepts and techniques, while readers who already have some experience with Photoshop can use this book to learn Photoshop CS3's more advanced features and newest tools. "Using clear, step-by-step, project-based lessons, each chapter walks readers through the creation of a specific project, with each chapter building on the reader's growing knowledge of the program, while review questions at the end of each chapter reinforce the skills learned in each lesson. "Photoshop CS3, long the industry standard for digital imaging software, offers plenty of new features and enhancements for creative professionals and digital photographers alike. Users can enjoy unrivaled editing with non-destructive Smart Filters, improved curves, and adjustable cloning and healing with Preview Overlay. Increase productivity with Photoshop CS3's streamlined interface and new Photoshop Lightroom integration. "Anyone who wants to create a composite will benefit from the revamped Photomerge tool, which lets you apply automatic layer alignment and blending to your images, while the new Quick Selection tool lets you select pixels not just by color, but by texture and shape as well. And digital photographers will be pleased to know that they can now process multiple Camera Raw images in a fraction of the time it used to take." Brimming with beautiful pictures, Photoshop CS3 Essential Skills guides you through a project-based, progressive curriculum so that you can build all the essential skills to enhance photographs creatively and professionally with Photoshop CS3. If you are an aspiring professional, enthusiastic amateur photographer, or a student learning photography, digital imaging, art and design, or design graphics, you'll be amazed at the stunning results you can achieve. A DVD is included free. We've got a great free chapter for you (Chapter One - Building Images PDF - 2.1 MB) from a new Photoshop CS3 book written by Stephen Romaniello called Photoshop CS3 Channels And Masks Bible. The book is easy to follow and easy to understand, and the first chapter is exactly what I would recommend a beginner should study to become familiar with the program. It is a general introduction to Photoshop which walks you through all of the tools and concepts needed to get your head around this program and start creating with it. Below you'll also find a link to a graphic from Chapter 2 from the book. This is the Photoshop CS3 Default Tool Palette (with all the flyouts showing). Photoshop CS3's tool palette displays the icons for 22 different tools in a tall, vertical palette. Some of the tool icons expand to access tools that are not visible, bringing the entire number of tools to 58 plus paint swatches, Quick Mask icons, and the view modes. Click the small black arrow on the lower right of the tool icon to display the additional related tools in a flyout menu. Thanks to our friends at Wiley for the free chapter and the free tool palette chart. Download Chapter One - Building Images (PDF - 2.1 MB). There are 22 chapters and almost 500 pages in this book, so to get a scope of what's covered download the Table of Contents (PDF - 1 MB). And here is a direct link to the graphic for the Photoshop CS3 Default Tool Palettes Chart, so you can print it out. 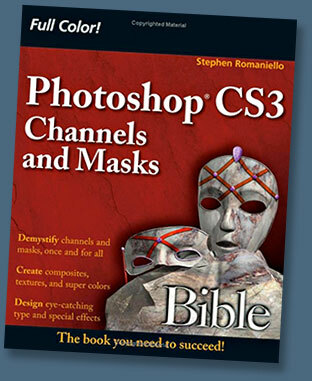 Buy Photoshop CS3 Channels And Masks Bible at Amazon.com (33% off). 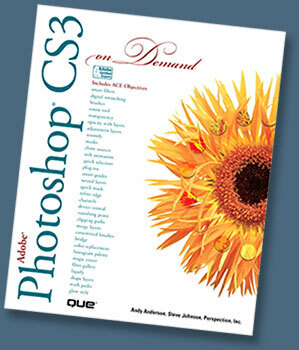 I'm a big fan of the Photoshop On Demand books, and the latest version, Photoshop CS3 On Demand is a real gem. Filled with everything you'll ever need to know to work in Photoshop, the book's best feature is the way the information is presented. Photoshop CS3 On Demand uses a series of examples that will give you a context in which you can perform a task, and includes workshops so you can put together individual tasks into different projects. And all of the Photoshop example files from the book are available on the web. 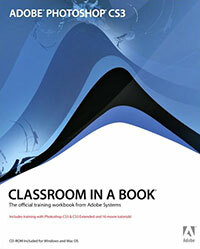 The book also includes ACE courseware that meets the objectives for the Adobe Certified Expert (ACE) Program. Upon completion of this courseware you may be prepared to take an exam for ACE qualification. Our friends at Pearson Publishing have set us up with a free sample chapter for your downloading pleasure. This chapter will walk you through setting up Photoshop for the first time, and is a great way to see if the book's info and style connects with you. Download Chapter Three - Customizing The Way You Work In Photoshop CS3. (PDF 1.1 MB).